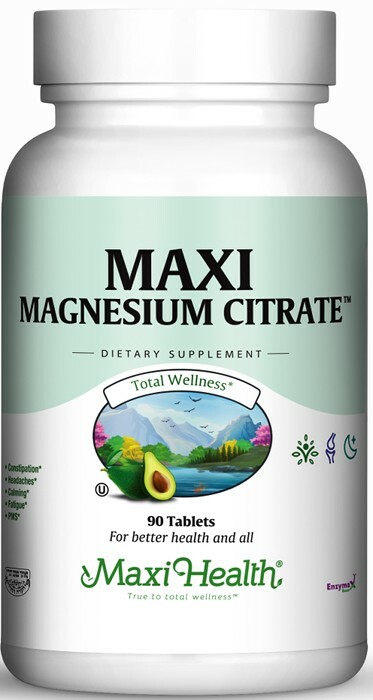 Maxi Magnesium Citrate™ is made from magnesium citrate. While there are many forms, it has been found to be the most absorbable. Just two tablets give you 100% of the Daily Value (based on a 2,000 calorie diet). Get your daily magnesium from Maxi Magnesium Citrate™. Take two (2) tablets daily, or as directed. Other Ingredients: Stearic acid, magnesium stearate, croscarmellose sodium, dicalcium phosphate, and Enzymax® (calcium carbonate, bromelain, papain, lipase, amylase, protease, silica), aqueous film coating (purified water, hydroxypropyl methylcellulose, vegetable glycerin). This product contains no animal products, wheat, gluten, salt, milk, yeast, soy, artificial preservatives, flavors or colorings.